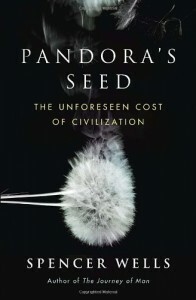 Spencer Wells argues in Pandora’s Seed that there are two critical events in humanity’s (relatively) recent past that have pushed us onto the path leading to modern civilization. Two cusps that have led to the marvels we enjoy today, as well as the horrors (which explains the book’s subtitle: “The Unforeseen Cost of Civilization”). The first took place 70-80,000 years ago when Mount Toba in Sumatra erupted, throwing millions of tons of ash into the atmosphere that caused a catastrophic climate shift. Archaic humans, who had been around for c. 100,000 years at the time and had expanded as far as the Middle East, were reduced to less than 10,000 individuals in Africa. This population bottleneck exerted enormous selective pressure that resulted in modern humans, men and women like ourselves both physically and mentally. The qualities selected for in those fraught generations after Toba were so successful, modern humans had spread to nearly every continent and into nearly every environment by 10,000 years ago, when the second event occurred – the Agricultural (or Neolithic) Revolution. Ten thousands years ago (give or take a few millennia – these dates are approximate) the world was in a warming trend and glaciers around the planet were melting. In the Middle East, the climate was bountiful and its human population was large for a hunting-gathering culture. In fact, for several thousand years, these tribes had been opportunistically harvesting grains and fruits, and semi-sedentary and sedentary villages developed in many areas. This Garden of Eden, however, was not fated to last. In North America, the Laurentian glacier melted, unleashing a catastrophic flood that washed down over the Great Plains and the Northeast and into the Atlantic. The influx of cold water shut down the Gulf Stream that kept (and today keeps) Northern Europe’s climate warm and temperate. The Middle East became drier and colder, and food resources scarcer. In previous eons, humans would have adjusted: Populations would fall, tribes would split up, numbers would eventually stabilize at a sustainable level. But populations were too large and too far removed from their hunting-gathering roots to easily return to their ancestors’ way of life. But they had been harvesting those grains for generations – modifying consciously or unconsciously many plant species – and it was a small step from that to deliberately planting fields that could ensure a more reliable food source. What came about was “civilization” – a culture of scarcity that gave rise to hierarchies, organized war, classes, specialization, as well as organized religion, philosophy, writing, technical progress, etc. A few weeks ago, I finished Derrick Jensen’s Endgame: Volume 1: The Problem of Civilization and Endgame: Volume 2: Resistance. Anyone familiar with Jensen’s work (or who’ve read my review) will know that he believes humans made a serious mistake when they turned from the lifestyle they had enjoyed and to which they were adapted for tens of millennia to one that forced them into a never-ending spiral of expansion, exploitation and violence, and for which their bodies and minds were ill-equipped to handle. Civilization will inevitably fall, and soon despite any stopgap measures we try to sustain things. For Jensen, humans will be infinitely better off in the long run the sooner we abandon modern life. Wells would agree that civilization has led to many unforeseen, unfortunate consequences. He would also agree that current civilization is unsustainable. And he would agree that physically and mentally, humans are not well suited to modern life. Wells is not a Luddite; however, he doesn’t believe we should return to a pre-modern lifestyle. Nor does he think civilization is irredeemable as Jensen does. In his view, while civilization has brought us to the dire straights the world finds itself in today, it also has brought us miracles of medicine and technology and holds the potential to develop the answers that will resolve our myriad crises. Assuming enough people recognize the problems and act appropriately. An assumption that makes this book unwarrantedly optimistic (IMO). Wells identifies the problem with the assumption in Chapter 2 where he defines and discusses what he calls “transgenerational power,” the capacity to affect future generations by our contemporary actions. And the mother of all acts was the development of agriculture. Humans have been scrambling to keep up with the problems caused by solutions reached to immediate dilemmas (like food scarcity in 10,000 BC) ever since. Two other examples from the book illustrate his odd disconnect between sunny optimism and the logical conclusions of his argument. In “Growing a New Culture” (Chapter 2), Wells starts off discussing the growing aquaculture industry in Norway, which seeks to replenish the fish stocks that have been destroyed in the wild by egregious overfishing. The “poster boy” of his brief digression is a farm in Stavenger that raises salmon. It relies on an elaborate and expensive technology that herds salmon and fools them into thinking restricted pens are their natural habitats. We’re doing this here and elsewhere, as Wells notes, because the natural, sustainable supply of cod, tuna, and other fishes is running out in the face of humans and their need for food. As a final irony – the Norwegian “fishermen” are forced to supplement their farmed salmons’ diets with the artificial astaxanthin. This replicates the pink flesh so prized by consumers but which is naturally brought about by the salmons’ diet in the wild, and (if that weren’t enough) it’s derived from petroleum. In “Heated Argument,” Wells begins the chapter discussing the situation of Tuvalu, a nation of nine coral atolls in the South Pacific. Because the seas are rising, Tuvalu will no longer exist by the end of the century. Because of civilization, Tuvalu’s economy has shifted from a reasonably sustainable one of subsistence agriculture to one of exportable crops and cash. The population relies on food imports, the waste products of industry are piling up, and tidal surges are making the ever-shrinking land too salty for agriculture. Yet, “I was beginning to get the impression that there were a fair number of people who hadn’t given up on Tuvalu” (p. 158). This isn’t a bad book, by any means. Wells is a good writer and presents his case well, and if he had stuck to the evidence for our biological adaptations to the environment and the consequences of consciousness and the Neolithic Revolution, this would have been a very good book. But he loses focus and goes off on tangents that deserve books all on their own, or (worse) he brings up a relevant consequence of our “transgenerational power” but wanders off into vaguely optimistic opinions about how wonderful things will be once we put our minds to solving the problem. I still recommend the book with a clear conscience. It brings together a lot of accumulated information about our past in one easy-to-read source, and I did learn a few interesting things, as in Chapter 4, “Demented,” where I learned about “sympatric speciation” (read the book to find out for yourselves). Or in “Fast Forward,” where I learned about the unintended (and revealing) consequences of our interference in the natural lifecycles of acacia trees.